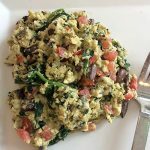 A staple in many American diets, scrambled eggs make for a filling breakfast and also work well as part of a quick and easy lunch or dinner. Except for people sensitive to dietary cholesterol most of us are no longer advised to avoid eating eggs, since consuming eggs in moderation isn’t likely to increase blood cholesterol levels. “In moderation” means no more than one or two eggs per meal, and no more than once or twice a week (even if eggs aren’t a problem for you). Eggs offer protein and several brain-essential B vitamins like choline, B12, and B6, as well as anti-aging selenium, which make them a healthy addition to your diet. Mixing in other nutritious ingredients such as spinach, tomatoes, and olives further boosts their nutritional value. 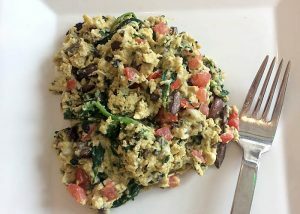 In a medium bowl, whisk together the eggs, tomatoes, olives, milk, and Feta. In a large pan, heat the olive oil over medium heat. Add the garlic and cook for 1 minute or until lightly brown. Add the spinach and basil and cook for 1 minute more. Add the egg mixture to the pan and toss with a spatula for 2 to 3 minutes. The eggs should be tender but not runny. Add the salt and pepper to taste. Serve immediately. I am a long time supporter of NPR and. Food Schmooze fan. This reminded me of “Tge Omega Plan” by Dr. Artemis Siminopoulos on Faith Middleton Show many years ago. Excellent research and so timely as I approach 70! Can’t tell you how much it means to us to hear that. Thank you so much for supporting public radio and The Faith Middleton Food Schmooze. We appreciate you right back! I have made this often. 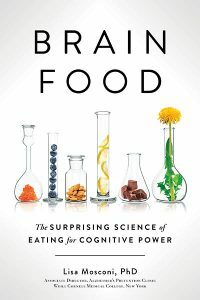 Never realized I was making brain food. Now 81 and going strong in the brain part. My grandfather loved to go fishing. So we had fish a few times a week. He would always announce Fish is good for your brains, in his slight Italian accent. Love this, Antoinette. Thanks for sharing your grandfather’s wisdom with us! Of course! Just sent you a note about how to get your book. Thank you for supporting us!